Rock out with your cocktail out in February with a Cucumber-Rosemary Gin and Tonic and a brand new playlist. Each month Bishop And Rook provides a Spotify playlist of new, local and touring bands and a complimentary alcoholic beverage. Interested in heading out to a local show? Check out our flyers (updated on the regular), and head to Charlie's Kitchen on March 2nd for our next sponsored event. 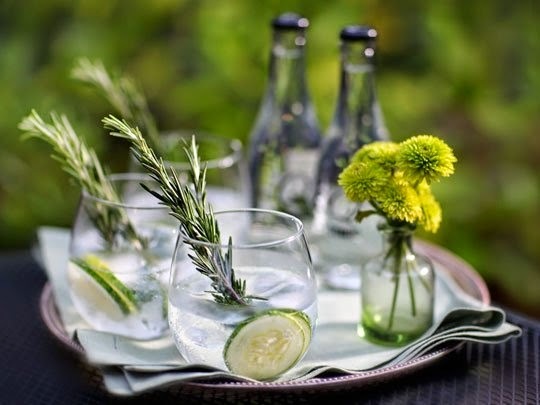 In a highball glass, add three slices of peeled cucumber, 1 sprig rosemary, juice from a lime wedge and 1 ounce gin. Muddle with the back of a spoon. Strain through a mesh strainer into a second highball glass. Add several cubes of ice, and three slices of unpeeled cucumber. Top with remaining gin and tonic, and serve garnished with rosemary sprigs. Want more cocktails? Need more music? Check out the complete ROWYCO archives.